Starting October 1, 2020, Alaska resident will need to present a REAL ID compliant license/ID, or another acceptable form of identification, for accessing Federal facilities, entering nuclear power plants, and boarding commercial aircraft. The Alaska Real ID is not mandatory, but if you want one you will have to apply in person and bring the documents required. Need to print a REAL ID Checklist? Click here. Want to know what documents to bring with you? Check out our online Real ID Checklist. For a complete list of the Fees click here. Passed by Congress in 2005, the REAL ID Act enacted the 9/11 Commission’s recommendation that the federal government “set standards for the issuance of sources of identification, such as driver's licenses.” The Act established requirements for state-issued driver’s licenses and identification (ID) cards and prohibits federal agencies from accepting licenses and ID cards from states that do not meet the requirements. 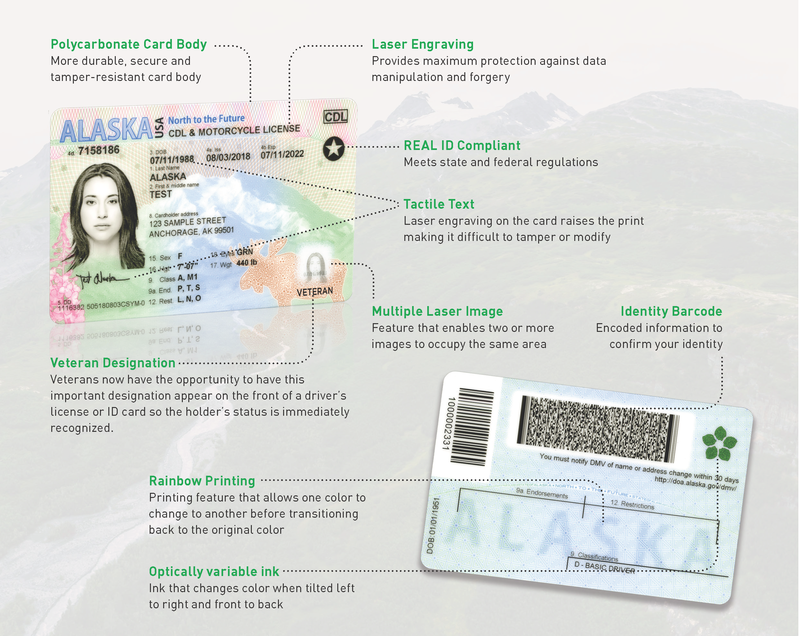 What is Alaska’s status with REAL ID implementation? On May 19,2017, Governor Walker signed the REAL ID bill into law, for Alaska to receive a Department of Homeland Security (DHS) extension through October 10, 2018. This means that federal agencies will continue to accept Alaska driver’s licenses and ID cards to enter federal facilities and military bases and to board commercial airplanes. DMV is currently developing and implementing the systems necessary to produce REAL ID compliant cards. Alaska has applied for final compliance with Department of Homeland Security and is awaiting final approval. Beginning in October 2020, non-compliant cards will no longer be valid identification to enter federal facilities, access military bases, and to board commercial airplanes. If you do not need access to those facilities, then you may not need a REAL ID. Additionally, you may already have another form of ID that is REAL ID compliant. These include a valid passport, a valid military ID, and some forms of tribal IDs. TSA list available here. What if I want a REAL ID and don’t live in a community with a DMV office? DMV understands that you may not have a DMV nearby. We are working with community partners to increase access to DMV services, including REAL ID cards. Mail in application details for standard (non-REAL ID) cards is available here. Can I still get on base and fly with my current license or ID? Yes, as long as Alaska has an extension from DHS, federal agencies can continue to accept Alaska’s non-compliant driver’s licenses and ID cards. Starting October 1, 2020, a REAL ID compliant license/ID card or another federally acceptable form of identification will be required to access federal facilities, enter nuclear power plants, and board commercial aircraft. *Note: Many federal facilities such as military bases, may have limits on identification documents accepted for entrance. Please check with the federal facility or military base before you visit. What are the benefits of a REAL ID compliant license or ID? Holders of compliant Alaska licenses and ID cards will be able to use them as identification to access federal buildings, including military installations, and board commercial, domestic flights* without additional documentation. After September 2020, old style cards and standard cards marked “federal limits apply” will not be accepted for entrance to federal facilities/bases or commercial flights. If I have a commercial driver’s license, do I have to get a REAL ID compliant CDL? All standard CDL cards currently in circulation continue to be valid until they expire. However, this type of CDL can only be used for official federal purposes while Alaska has an extension from DHS and ends on the federal enforcement date of October 1, 2020. Downgrade to non-commercial DL upon CDL expiration if the CDL isn’t needed/wanted. Stick with the standard CDL in hand knowing that it can't be used to access federal facilities past October 1,2020 but is otherwise valid until expiration. How does the 5-year Hazardous Materials Threat Assessment Check requirement work with an 8-year CDL? Federal and state regulations continue to require the check at 5-year intervals, regardless of the duration of the CDL. Starting December 20, 2018, the expiration date of the hazardous materials endorsement will appear on the reverse side of the CDL. A new threat assessment check plus issuance of a duplicate CDL is required to retain the endorsement. Why does my school bus license expire in 5 years instead of 8 years? In accordance with Alaska Statute 28.15.046, the duration of a school bus license is 5 years. Were you born in Alaska and need a copy of your birth certificate? Visit www.vitalrecords.alaska.gov and select “Birth Certificates” under “Order Certificates”. Submit the request form with the appropriate documentation and fee to receive a copy of your certificate for a REAL ID-complaint license. "If you have questions about the birth certificate request/application process...” ?, please contact Alaska Vital Records Office at (907) 465-3391, Monday through Friday, from 8AM-5PM Alaska Time. Were you born in another state and need a copy of your birth certificate? Please click here to see if you can get a copy using this nationwide site. What do the REAL ID compliant cards look like? Alaska’s cards have been completely redesigned to offer a more modern, secure and durable credential. Both standard and REAL ID cards will have the same design but will contain different markings. REAL ID cards will be marked with the REAL ID star on the top right corner. Standard cards will not have the star and will be marked “Federal limits apply.” The duration of all five-year card types will increase to eight years. Alaska DMV is proud to announce the release of their newly redesigned driver license and ID cards. These credentials will now be produced using a highly secure substrate called polycarbonate. As a card material, polycarbonate is the most durable substrate on the market today, and it houses the most level 1 security features – giving your card the highest barrier of defense against counterfeiting and attacks. How much will does REAL ID cost? How many REAL ID cards can I have? Federal and state laws allow a person to hold only one REAL ID compliant card and only one driver’s license at any time. Alaska residents may simultaneously hold an Alaska Driver’s License and Alaska Identification card, but only one can be compliant. It is also permissible to hold identification cards issued by other states if only one is REAL ID compliant and the driver’s license is not REAL ID compliant. Issuance laws vary between states. While Alaska allows multiple credential types, many states do not. Issuance of an Alaska REAL ID license or ID card may trigger cancelation of other state’s identification cards per the laws of the issuing state. Is REAL ID just a way to create a national database? No. REAL ID does NOT create a federal database of driver’s license information and does not create national identification cards. REAL ID is a set of national standards for issuing licenses and identification cards. Each jurisdiction continues to issue its own unique license, maintains its own records, and controls who gets access to those records and under what circumstances. The purpose of REAL ID is to make our identity documents more consistent and secure. Will the card have a chip in it? No. REAL ID cards do not have a chip in them. Why is my REAL ID marked “Limited Term”? “Limited Term” indicates the REAL ID card expiration date of a temporary resident with lawful status is matched to the length of authorized stay in the U.S., typically less than the normal 8-year license period. This marking does not apply to standard cards that similarly display shortened expiration dates based on authorized stay. How do I find more info on card types? Check out our Alaska Card Types Flyer. Click here for more TSA info.